DEON Optical Design Corporation – японская компания в первые заявившая о себе в конце 2004 года. Команда опытных инженеров смогла в короткие сроки разработать оптические прицелы премиум класса. Главным достоинством прицелов, выпускаемых под маркой MARCH является невероятно высокий коэффициент увеличения, не имеющий аналогов среди оптических прицелов. Фирменная оптическая схема позволяет независимо от увеличения получать реалистичное изображение. Вся выпускаемая продукция собирается вручную и проходит суровые испытания, что позволяет гарантировать высокую надежность и долговечность. March-FX 5-40x56 благодаря самому высокому на данный момент коэффициенту увеличения в 8 раз является оптическим прицелом с самым широким диапазоном увеличения на российском и мировом рынке среди оптики с расположением прицельной сетки на первой фокальной плоскости. Прицельная сетка изменяется в размерах при изменении увеличения, следовательно, баллистические точки всегда будут показывать “точное значение” независимо от кратности. Высококачественное изображение достигается благодаря линзам ED со сверхнизкой дисперсией, что практически полностью устраняющие хроматические аберрации. Многослойное просветляющие покрытие значительно уменьшает потери света позволяя получить четкое и контрастное изображение на всем поле зрения. Все эти характеристики сделали возможным достичь максимальное возможное на данный момент светопропускание в 98%. Big on features yet not too bulky. First Focal Plane (FFP) reticle with 8x zoom ratio. The highest FFP zoom ratio in the world. Available in two Mil-rad versions and also in two MOA versions. 24 Mil Radian elevation adjustment. 12 Mil Radian of windage adjustment. Choice of 10 moa per roation of turrets with 1/8 clicks or 25 moa per rotation version with 1/4 clicks. Choice of illuminated or non illuminated glass etched reticles. FML-1 for m-rad and FMA-1 or FMA-2 for MOA version. Supplied with Sunshade, New Tactical flip covers. 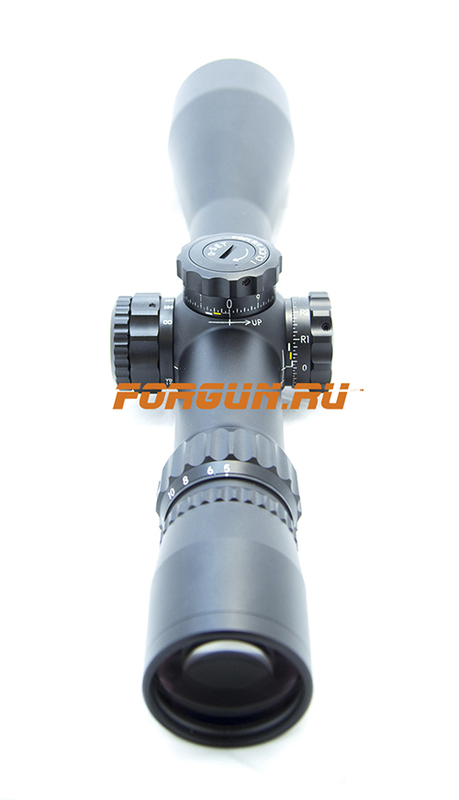 This zoom scope has an 8x magnification ratio, which is the highest magnification ratio in a FFP (first focal plane) configuration rifle scope made to date. Available in three (3) versions. Mil Radian and two Minute of Angle (MOA) versions. The MOA version with the FMA-1 or FMA-2 reticle scale value also remains constant across the entire zoom range. Target ranging is accurate at any power. Can choose from two versions.One version has 25 MOA per turn of the dials and has 1/4 moa clicks. The other version has 10 MOA per turn of the dials and 1/8 moa clicks which is usually more useful for target shooting. Additionally, with the capability to set any position as the zero point in elevation with the 0-set function, the shooter will never lose their starting calibration. As with all March scopes, high end extra-low dispersion (ED) lenses are used and the 56mm front lens delivers superb optics. Comes in illuminated and non-illuminated reticle models. For illumination models, Standard and Low intensity modules are available. Each module provides 4 levels of reticle intensity (red) and can be cycled through by simply pressing the pressure switch within the focus dial knob. There is a new optional illumination switch which has 6 levels and each level can be set or locked . For Mil-rad version the reticle centre "floating"dot size is .05 mrad. For MOA the FMA-1 illuminated reticle has the centre "floating" dot of 1/4. 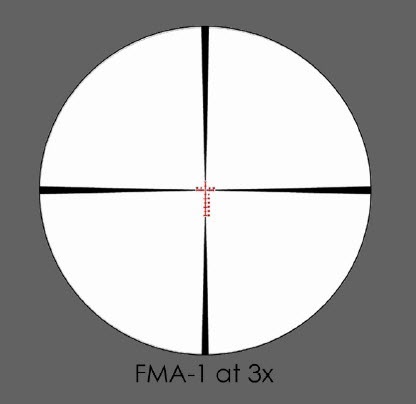 The FMA-2 reticle is only available for non illuminated MOA versions. The centre "floating" dot is 1/8 at all magnifications. The line thickness of the reticle grid section is half that of the FMA-1. Therefore it is not a "thick" reticle as is often associated with FFP and is similar to the thickness of reticles in SFP target scopes. This reticle is specifically design for Target Shooting by Stuart Elliott and Gary Costello. The 1 moa line spacing (graduations) remain constant over the entire zoom range so a target shooter can confidently use these graduations for calculated hold offs at any and all zoom (magnification) points. 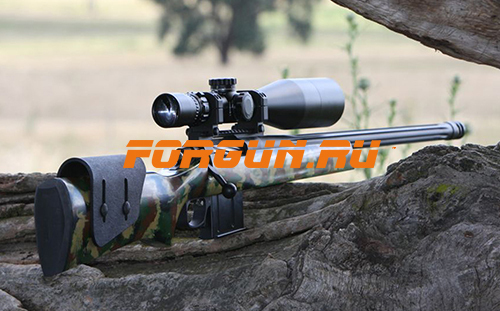 Also with FFP scope design the point of aim does NOT shift throughout the entire zoom range. So a shooter can confidently zoom up or down in the process of shooting one target session. No point of aim shift. The hold off points of the graduated reticle remain constant with 1 moa spacings, relative to the target at any distance, on any zoom level. A simple, 100% accurate, precise aiming platform. *Special note about Zero set facility. The Zero set or "0- set" facility is designed to work in the lower half of the total range of elevation adjustment. Zero set is handy so that you can return to a set point especially when using the dial for long range shooting. You may have wound the dial a long way and want an easy way to come back to a pre-set stop. 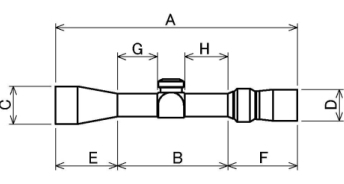 Anyone shooting long range should be utilizing a mounting system to forward slope for the scope regardless which keeps the optical centre of the scope approximately in the middle of the total adjustment which will be utilized. For example a 20 moa or 30 moa rail. This is what the zero set feature is designed to work with but it may not work with a 0 rail slope rail or mount system.